Reactions were swift — and mixed — to a bill filed in the Tennessee Senate Wednesday that would require county school systems to transfer ownership of school buildings to newly created municipal school districts that lie within county boundaries. Senate Bill 1755, introduced by Republican state Sen. Todd Gardenhire, seeks to remove one of the potential obstacles to municipalities breaking off from county school systems — a move now being considered by the town of Signal Mountain — by requiring school buildings to go with the students when a new district is formed. The Chattanooga Republican said he was asked by a Memphis attorney to introduce the bill because of his position as the chairman of the Senate Education Committee's K-12 subcommittee. 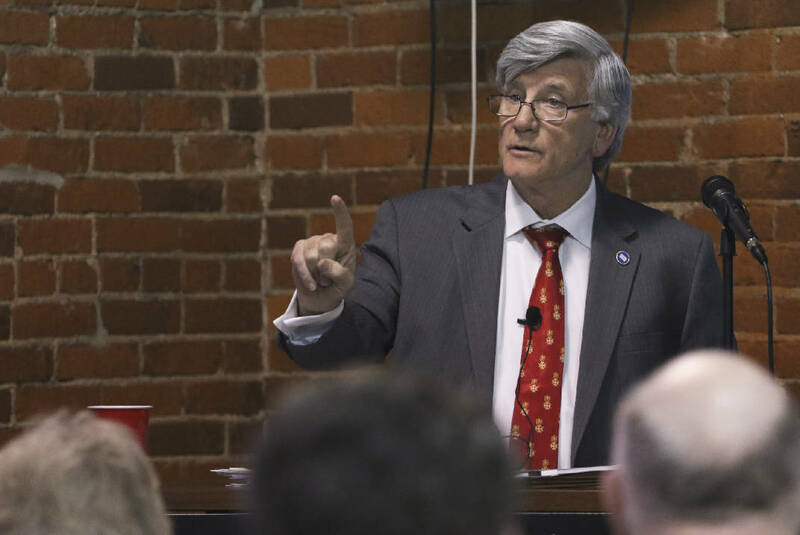 Despite the senator introducing a bill that could clear the way for a break from the Hamilton County Schools system, a number of people in the Signal Mountain community are up in arms over Gardenhire's involvement, saying he doesn't represent the mountain. 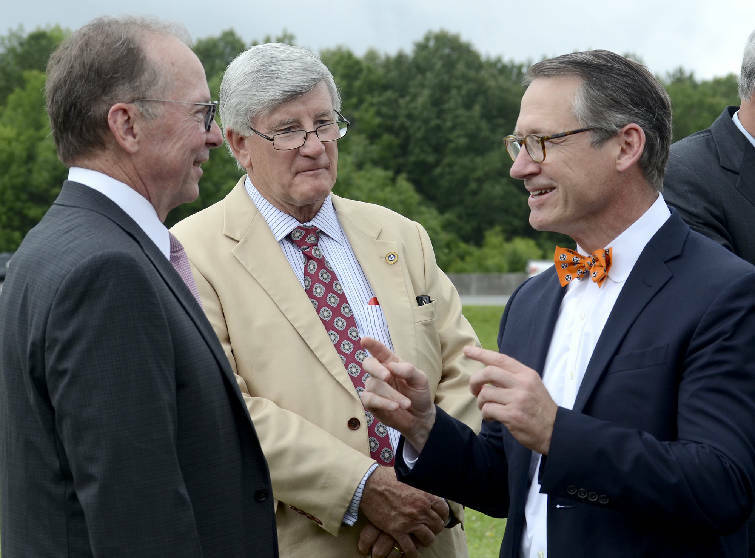 From left, Tennessee Transportation Commissioner John Schroer and state Sen. Todd Gardenhire, R-Chattanooga, listen as state Sen. Bo Watson, R-Hixson, speaks. "My thoughts are that it is premature," said Elizabeth Baker, a Signal Mountain resident and member of the Stay with HCDE [the Hamilton County Department of Education] group that has been raising opposition against the split since the idea first took off more than a year ago. "I don't understand why Sen. Gardenhire was the one who introduced the bill, there appears to be nobody in his constituency district who is creating an independent school district." Renée Robinson Shoop, another Signal Mountain resident and member of Stay with HCDE, also was wary of Gardenhire's involvement. "The idea that a Chattanooga representative would introduce a bill that may or may not benefit a Shelby County district was rather unbelievable," Shoop said. "It feels like they are grasping at straws ... it's very clear that it's going to impact Signal Mountain." Republican state Sen. Bo Watson, who does represent the mountain, said he was also shocked by the legislation. "I believe that the legislation is premature," Watson said. "It's still a local decision that needs to happen." Watson did affirm that he would support what his constituents choose to do about the schools, though. "The decision should be left to a local community," he added. "Current law allows Signal Mountain to hold a referendum, then if they decide to have an [independent school district], it's my responsibility at that point to remove any barriers that exist in state law for them to do that." That local decision has seemed bogged down in recent months, as the debate on whether Signal Mountain schools should split from Hamilton County has continued. Earlier this month, a heated Signal Mountain Town Council meeting led to discussion on the next steps for the School System Viability Committee, the Signal Mountain Town Council committee formed to investigate the feasibility of a split. John Friedl, chairman of the committee, predicted that the group's marching orders could come out of today's work session. He spoke favorably of Gardenhire's bill. "It seems like a sensible approach that would avoid a whole lot of wasted money litigating the issue," Friedl said. "It doesn't resolve the whole issue because no school district can be formed without a referendum by the voters. What this does, it would simplify the process so you didn't have to litigate before taking it to the voters." It is that lack of public support or an official vote that worries those who are against the bill. "I felt like there had just been a tidal wave, a momentum that had been built against the split, and this just flies in the face of popular opinion," said Michael McCamish, a resident of unincorporated Hamilton County and member of Stay with HCDE. "I think it's unconscionable and immoral," Shoop echoed. "It is incredibly harmful for our community, because it effectively isolates people who live within the town and alienates half the population of the mountain." The companion House Bill 1757 also was not introduced by a Hamilton County representative. State Rep. Harry Brooks, R-Knoxville, District 19, introduced the bill in the House. Municipalities splitting from county school systems is not a new issue, nor is it isolated to Signal Mountain. Six municipalities in Shelby County started their own districts in 2014, after the Memphis school district merged with Shelby County Schools in one of the largest school mergers in the nation's history. Other areas of the state, five or six, Gardenhire claimed, are interested in such splits. Brentwood and Farragut are both areas that have seen recent talk of creating independent school systems, and locally both East Ridge and Red Bank have had such dialogue. It is unknown how much support the bill will have in the House, but state Rep. Patsy Hazlewood, R-Signal Mountain, in District 27, also feels it is not well timed. "I think it's at best premature, state law," Hazlewood said. "I'll be watching the bill carefully ... I've had an intense conversation with Rep. Brooks and had a heated discussion with Sen. Gardenhire." Hazlewood has stood firm in her stance against a Signal Mountain split that did not benefit all of her constituents. "One of the things that I have said since the beginning of this decision [is] any school system, any solution on the mountain has to be for the mountain," she said. "Any solution has to be a solution for all kids." Gardenhire said the bill would take away a substantial barrier for Signal Mountain. The Hamilton County Board of Education voted in November to pledge not to sell or transfer ownership of the buildings, and requiring that transfer by law would potentially pave the way for the split. Not all of Hamilton County Schools' property is owned by the school district, however. Seven properties are owned by Hamilton County and another 10 are owned jointly by the county and the school system. "The Signal Mountain school buildings and properties are Hamilton County general government assets purchased with taxpayer dollars," said Jim Coppinger, Hamilton County mayor. "We currently owe $17.5 million on the bonds that secure these buildings. Therefore, we are interested in the details of any legislation considered in this session or any future session." Signal Mountain Mayor Chris Howley said it is "common sense" to transfer ownership to a new school district — that it "clarifies the laws already on the books, that schools follow the communities." Howley does not feel the introduction of the bill — which still needs to pass the Senate Education Committee and the Finance Committee before it reaches the floor for a vote — changes Signal Mountain's current position. "I don't think it changes what we're doing," Howley said. If the change in law does help Signal Mountain split, Gardenhire thinks it could shine some light on Hamilton County's other schools. Signal Mountain includes three of the county's top-performing schools — Signal Mountain Middle/High, Thrasher Elementary and Nolan Elementary — which typically balance out lower-performing schools in the school system's testing data. "I think what will happen is parents will finally see the shape of the schools," Gardenhire said. "It will be a shock."